Learning how to identify and count coins and bills is an important set of math skills for young learners. Plus, kids just love using play money when they role play – it makes them feel so grown up and important. We decided to combine the learning aspect of money printables with the fun of our adorable pups (get more pups activities). 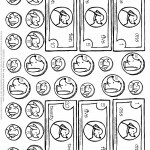 Click on the images to download the printable bills and coins, the pups play purse and wallet. For the purse, print two copies to make a front and back. Use as a pattern on fun paper, felt or fabric and add glitter, beads or other adornments.